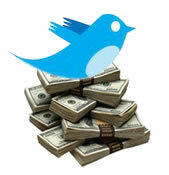 Twitter To Start Charging Companies For Having An Account? Companies using Twitter for commercial purposes may soon start getting charged for that activity, according to an interview British trade magazine Marketing (part of BrandRepublic) held with co-founder Biz Stone. Stone did not give any details regarding pricing or the specific way Twitter would go about charging users and for what exactly. As a reminder: the startup has raised $20 million in venture capital to date and recently turned down an acquisition offer from Facebook. One of the most recent examples of companies using Twitter for commercial purposes is Dell, who reportedly made $1 million in sales during the holidays via the micro-sharing utility, and recently started giving discounts exclusively to its followers. We’ll see more of this type of behavior in the future beyond any shred of doubt, but I’m wondering what exactly is considered as ‘commercial usage’ by Twitter management: does it mean any way of promoting a product or service or only when there’s sales activity connected to the corporate accounts? And will companies be prepared to pay up for use of the service at all? Update: as Peter Kafka points out in comments, there was good article two days ago in New York Magazine which reveals a little more of where Twitter is headed.